Suitable for exterior landscape renderings and can be used in gamedev as props or in mobile games as player vehicle. All cars are bearing minimum to none similarities to real life cars and completly trademark clame proof. 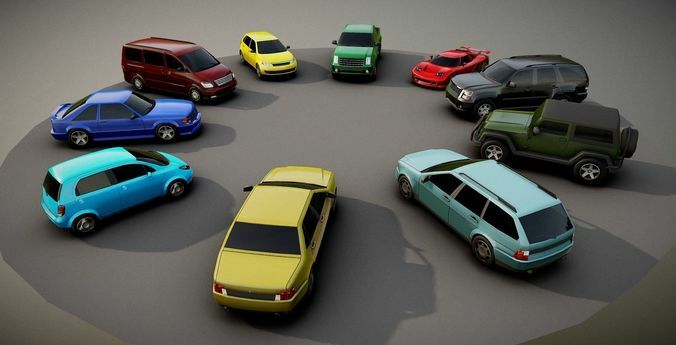 Each car has 6 different colors texture, metallic, glossiness and opacity, also, they can be rendered without textures at all using only material color or vertex paint. The interiors are faked and serve the purpose to be visible trough tinted glass, it is done for the sake of polybudget. Archive with all separate cars and textures is uncluded. great job! I will purchase this when I need it in the future, it will save me a lot of modeling time :) Is there a version with albedo textures (just the solid color without AO)? btw from the description this model is PBR, but in the model details it says it isn't PBR, it may be a mistake? Great car pack. Just put some materials on them and your good to go. Great models! Thank you very much! Great deal on these cars, they render nicely and are perfect for a parking lot scene.